We took the kids to see Disney’s A Christmas Carol last night (super-quick review: an intense telling of the story, Jim Carey could legitimately win an Oscar for it if he isn’t careful, the 3-D is so good that I can’t imagine it not being the future of all movies, but way too scary for the kids – especially the seven-year old. Consider this your Parental Guidance). Anyway, during the previews (most of which were also in 3-D, by the way), there was an ad for something called FathomEvents.com. Before a studio audience, Glenn will tell you about the real life events that inspired him to write The Christmas Sweater, and he’ll share stories of the overwhelming response he received about how the tale’s message of redemption literally changed people’s lives, bringing many back from the brink of collapse and restoring family relationships. Then, Glenn will show a re-mastered and exclusive version of The Christmas Sweater taped live during his 2008 cross-country tour. Afterward, Glenn will introduce you to some of the people who were touched by the story and you’ll experience their intimate journey of transformation through the simple gift of redemption. This incredible Christmas celebration will be simulcast to HD movie theatres all over the country. Join Glenn for the next evolution of The Christmas Sweater and see for yourself why critics and audiences alike are heralding it as a new American classic. OK, seriously. Who let this guy out of his cage? What’s next? Rush Limbaugh Sings the Classics? 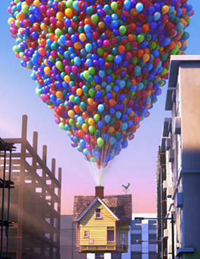 Perhaps the only thing wrong with Pixar’s latest movie, Up, is that it’s a Pixar movie, and as such, parents of young children might expect a light-hearted romp with a mild morality lesson at the end like Cars or Toy Story. What they get instead is somewhere between Finding Nemo and Hamlet (OK, a lot closer to Finding Nemo, but make no mistake – this is heavy stuff). Our story concerns a young boy who is painfully complacent. He watches movies and newsreels about great adventurers and their adventures, but his idea of an adventure is jumping over a crack in the sidewalk or pretending his helium balloon is an explorer’s aircraft. He meets other kids who are more daring, and although he desperately wants to be like them, it’s just not inside of him. Most of the time, he can’t even bring himself to speak. He just watches life go by. The young boy eventually grows up, marries a nice girl, and lives a dull, ordinary life as a balloon salesman at the local carnival. In his elder years, his wife dies, leaving him all alone in their tiny little house with nothing but his memories of her and his regrets about all the “adventures” they never got to take together. A real family fun-fest, huh? From there, we have a bit more of what you’d expect from a Pixar movie. The man decides to go on one honest-to-goodness adventure before he dies, so he rigs his house with thousands of helium balloons and flies it to South America (obviously, one of his lifelong regrets is never having taken a high school physics class, but I digress). Turns out a boy scout is on his porch when he takes off, and along the way, they run into a pack of talking dogs, a giant, multi-colored bird, and one of the adventurers of the man’s youth. The ending is satisfying and touching, and I won’t ruin it for you here. Up is excellent film making in just about every way. The characters are multi-layered and expressive. Good acting, except that they’re all animated, so there isn’t any acting at all (at least not physically). The story is well written, although there are a few “why did that happen?” moments, but nothing I couldn’t forgive for the greater good. And, of course, the movie looks fantastic. Pixar is truly Disney’s high-end brand now, and Up is no exception. I saw the 3-D version, which was understated enough to enhance the movie without distracting from it (if you have the opportunity to see it in 2-D, go for it – I don’t think you really miss much in this case). As for the heavy stuff, yes – it is a bit stark, but no more so than Nemo’s mother or Simba’s father dying in Finding Nemo and The Lion King. As long as you (and your kids) know what you’re getting into, I don’t think there’s anything in this film that would be off-putting or inappropriate. And if they get a little scared? Just tell them to wait for the talking dogs. With Angels and Demons, Ron Howard and Tom Hanks take on another Dan Brown novel that deals with high drama in, around, and about the Catholic Church. Like The DaVinci Code before it, Howard and Hanks turn out an excellent movie – gripping in its drama, engaging in its many action sequences, and satisfying in its ability to wrap up all the loose ends with a satisfying “reveal” at the end. This is one of those movies that seems to end soon after it started, until you look at your watch and find out that more than two hours have flown by. It’s the kind of movie where you walk out of theater talking to your date/spouse/friend about the intricacies and implications of the plot. Especially if you’ve read the book. Seeing this movie after reading the book is like reading the Fodor’s book about England cover-to-cover and then getting off the British Airways flight in Rome. It’s like being hit in the face with a bucket of cold water, drying off, and then having it happen again. Like walking into your favorite Chinese restaurant and finding out that the special of the day is Chicken Parmigiana. Like whiplash, only with popcorn. I realize I’m a little late to this party, having finally acquired a babysitter and convinced my wife to go, but I just returned from seeing the Star Trek movie. My first order of business (aside from paying the babysitter) was to finally read both Ilya’s review and Jason’s pre-review, review, and post-review, all of which I’ve been saving for this moment. We’ll start with my thoughts on the movie, and then move on to my thoughts on my friends’ thoughts. Before I even begin, though, I can see how this will take a while, so I offer a page-fold for those who don’t have the time nor the interest to go further. And oh yes, there are spoilers. Lots and lots of ‘em. Trust me – if you haven’t seen the movie yet, just move along. 3. Return of the Jedi belongs under “R,” not “S” as in Star Wars Episode IV: Return of the Jedi. This rule applies to all films in the original Star Wars trilogy; all that followed start with “S.” Similarly, Raiders of the Lost Ark belongs under “R,” not “I” as in Indiana Jones and the Raiders of the Lost Ark. Conversely, all films in the Lord of the Rings series belong under “L” and all films in the Chronicles of Narnia series belong under “C,” as that’s what those filmmakers called their films from the start. In other words, movies are stuck with the titles their owners gave them at the time of their theatrical release. Use your better judgement to apply the above rule to any series/films not mentioned. Step #5 is taken care of above. Step #6 is always a problem for me. I simply don’t know 5 bloggers well enough to tag them with memes (especially when the meme comes from one or more of the bloggers I do know. So I’ll unceremoniously tag Jeff Porten, and leave it at that.